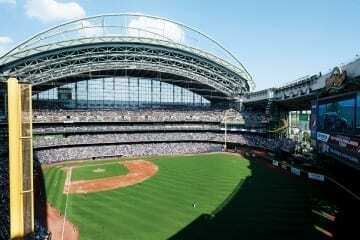 Catching a Brewers game at Miller Park is great, but tailgating is an essential part of the Milwaukee baseball experience—akin to having a Primanti Brothers sandwich in Pittsburgh, respecting the legends at Monument Park in Yankee Stadium, or yelling obscenities in Philly. Tailgating at a Brewers game is an art form—an asphalt canvas adeptly painted with wisps of grill smoke and dotted with loaded coolers and random tables filled with questionable dietary choices. Every tailgate artist has their own style, but there are a few basics to consider while enjoying the sprawling parking lots outside of Miller Park. The Miller Park lots open three hours before game time. Get there early to get a spot close to the ballpark and to ensure that you’ve got plenty of time to take in the atmosphere. Note: If portable toilets aren’t your thing, the Yount and Uecker lots east of the stadium are a short walk to the (relatively) fancy restroom amenities at the Sausage Haus. Bratwursts are the grillables of choice. Tailgating outside Miller Park. Scott Paulus/Milwaukee Brewers. There’s always some guy throwing a pricey New York strip on the Weber, but the truly skilled parking lot chef knows how to perfectly sear Milwaukee’s favorite sausage without it bursting and freeing valuable rivulets of juice. Sidestepping the uncomfortable “to parboil or not to parboil” argument (that’s worthy of an entirely different article), I take my cooking advice from Usinger’s. The sausage purveyors suggest parboiling brats in beer and onions (of course) before slow grilling on low to medium heat. Extra points if you can keep the cheddar inside the cheddarwursts for the duration of the cooking process. Save room for ballpark fare. One of the great joys of a Miller Park visit is a Klement’s bratwurst covered in sauerkraut and Secret Stadium Sauce (or a similar encased meat variation with the toppings of your choice). Don’t eat too much at your tailgate to ensure that you can stomach these culinary delights inside the ballpark. Leave the Imperial IPAs at home. Hot summer days aren’t conducive to high ABV beers if you plan on remaining coherent for more than three innings. Keep your beer selection local, but also make sure it’s relatively sessionable. Try Sprecher Special Amber, the latest Lakefront SMaSH Ale, Good City Motto IPA or any low ABV brews from Milwaukee’s growing list of new breweries. If you want to take the baseball theme to another level, snag a growler from the appropriately named Broken Bat Brewing Company. Tailgate salads are best served with mayo. Romaine and iceberg lettuce wilt when exposed to the sun. It’s a scientific(ish) fact that mayonnaise forms a protective layer over potatoes, pasta, veggies, etc. The best salads at a tailgate are those that can be eaten with a spoon. The lot is a sharing economy. Be prepared to share charcoal, lighter fluid, matches, a bottle opener, a beer or two, etc. with passersby. The parking lot is about community. Parking spaces make for tight quarters. Keep the banter between you and your neighbors friendly and your music volume to a minimum (or better yet, listen to the pregame on WTMJ 620 AM). Show some respect to those around you—even if they’re Cubs or Cards fans—to ensure that everyone has an enjoyable visit to Miller Park. Stay classy Milwaukee. Take a picture with Robin Yount or Hank Aaron. Or at least statues of the two legends that reside near the home plate entrance. After that, pay your respects at the Workers Monument that honors those who built Miller Park, especially Jeffrey Wischer, William DeGrave and Jerome Starr who perished in the 1999 crane accident during construction. Clear up the tattered remnants of your tailgate and head to the turnstiles in plenty of time to see first pitch. The siren song of the lot may implore you to stay, but remember that baseball is why you came. Besides, Miller Park rules dictate that tailgating ends 30 minutes after the game starts. Go Brewers!